The US solar thermal marketplace is already reaping the benefits of the recently announced partnership between European solar thermal manufacturer GEO-TEC Solar Industries and North American solar innovator SunMaxx Solar. The SunMaxx TitanPower Plus-SU2 flat panel solar collector has received OG-100 certification. More notably, this collector achieved the highest OG-100 energy output rating for collectors using ethylene glycol as a transport medium. 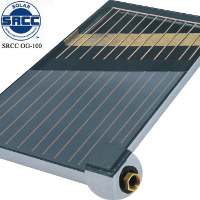 SunMaxx Solar now leads the industry with this new line of solar flat plate collectors. Product inventory is currently available for immediate delivery from our California, Colorado and New York warehouses.